The Ultimate Smile Professional Teeth Whitening arrives in a simple aqua blue and white box. The directions are inside of the box, as well as 2 injection tubes, 2 mouth pieces and a plastic container, for which the mouth pieces do not easily fit into. But, you are able to cram them into the container and I did. The directions are somewhat awry. The first step instructs one to, "Place thermal tray in hot water (approximately 200 degrees) and get your teeth impressioned0..." I figured out how to do this. It's just oddly worded. I did two sets of applications and with each time, my teeth did become whiter. Unfortunately, there were two spots which ached during and after the application. I do not blame the product for this. But, I'd be remiss not to think that there is some connection therein. 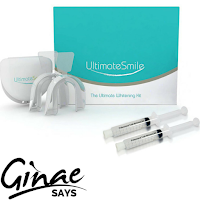 Ultimate Smile lists for $168.88 on Amazon. However, it sells for $24.99. You may get it from the link just below this sentence.